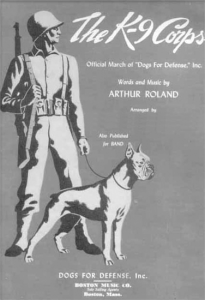 Tomorrow celebrates the 69th anniversary of the War Dog Program launched by the U.S. Army March 13, 1942. Many brave dogs served in various war efforts including scouting, message couriers, patrolling, sentry duty and mine-detecting, not to mention the companionship they provided to our troops. Dogs continue to play a vital role in war efforts around the world and in many ways have become great peace keepers and ambassadors for the United States! Hats off to our service men and women and the K9 Corps!